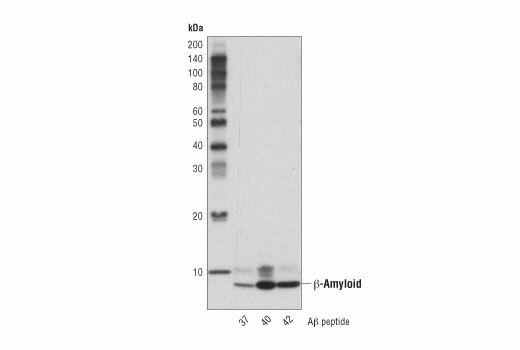 Western blot analysis of human Aβ-37, Aβ-40, and Aβ-42 peptides using β-Amyloid (D3D2N) Mouse mAb. 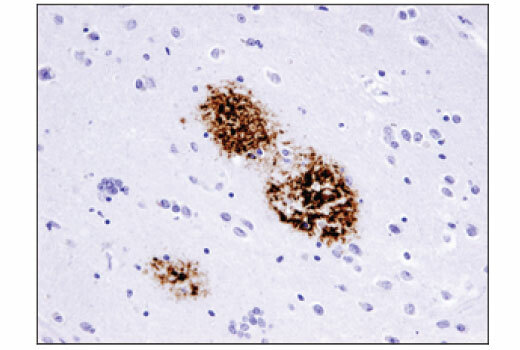 Immunohistochemical analysis of paraffin-embedded human Alzheimer's brain using β-Amyloid (D3D2N) Mouse mAb. Confocal immunofluorescent analysis of brain sections from 13-month old wild-type (left) and Tg2576 (center) mice using β-Amyloid (D3D2N) Mouse mAb (green) and β3-Tubulin (D71G9) XP® Rabbit mAb #5568 (red). A detailed view of a cortical β-amyloid plaque is shown on the right. Blue pseudocolor = DRAQ5® #4084 (fluorescent DNA dye). 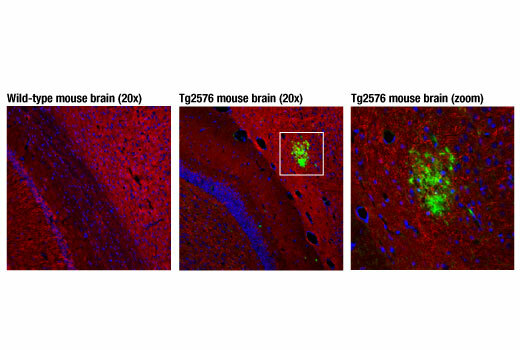 β-Amyloid (D3D2N) Mouse mAb recognizes endogenous levels of total β-amyloid peptide (Aβ). This product detects transgenically expressed human APP in mouse models.